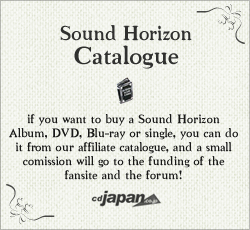 Sound Horizon featured on KERA magazine and HOTTRACKS Korea. This month, Revo has been interviewed for the February issue of the japanese fashion magazine KERA, where he’s been asked about the new album, the Story Concert and the stage outfits designed ad hoc. Also, a report on the 7th Story Concerts has been featured in this month’s edition of the free Korean magazine HOTTRACKS. The report includes some photos of Märchen and Elize, Joelle, Tomoyo and REMI on stage. Enjoy! Thanks to Feggari-san and hudie.com for the lovely scans! It has been confirmed that this year’s Cafe won’t be in an open square, but in an event space. 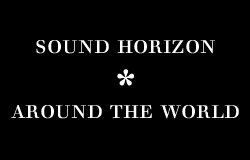 Concretely, it will be at the Roppongi TV Asahi umu EVENT SPACE. Who knows, maybe TV Asahi will do some report on the Cafe in TV!